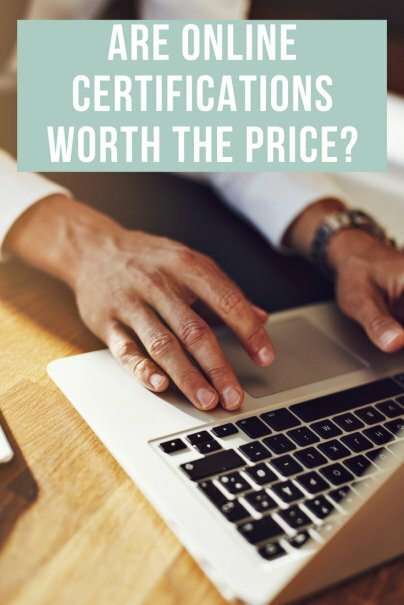 Home » Career and Income » Are Online Certifications Worth the Price? Online certifications are available on a number of platforms. They tell you they can help you get ahead in your current job, change careers, or start your own business. They claim to save you time from traditional schooling and connect you to other like-minded people who will help your career skyrocket. If you like your job and the company you work for, and you're hoping to move up into a new role at this company, you have the perfect scenario to do some research before you decide whether or not to pay for a certification. Have a conversation with your boss about your career path, and ask if he or she thinks a certification would make a difference. Don't feel comfortable asking your boss this kind of question? That's understandable — I've had bosses like that! There are other ways to find out if a certification matters. Find people at your company who have a role that you'd like, and take them to coffee. Ask about their education and training so you can figure out if a certification could help. If you have a knowledgeable and helpful Human Resources department, talk to your HR representative. Tell them about your ideal career path and see if the certification would make a difference from their perspective. If it does and you're willing to do the work, they may even have some professional development funds that they could provide to offset the cost. This takes a bit more work on your part, but it's completely doable. Social media to the rescue! Do a search on LinkedIn or Twitter to find people who work at companies and in roles that interest you. Look at their training and experience to see if they mention a certification. Then, introduce yourself to them online and see if they'd be willing to chat with you about their experience. I've done this a number of times, and people are often very quick to offer up their perspectives. I've also had people reach out to me for this kind of chat, and I have always been happy to help. A second option is to get involved: Join LinkedIn Groups, go to conferences and events, and subscribe to newsletters related to your new career interest. This is a great way to make connections, get advice, and ask questions. Curiosity gets rewarded, so always seek to learn what's worked for other people by asking them about their experiences. You could also investigate a range of different job postings in the field that interests you. Is a certification listed as a requirement or a preferred qualification? Don't be shy about reaching out to those companies to find someone willing to share the company's perspective on the value of certifications. They are looking for qualified applicants, and your interest in them could yield not only information on certifications, but valuable contacts in your new field. Another strategy is to reach out to a recruiter in that field, and ask them whether certifications make a difference as they are looking for applicants in the field for a variety of companies. I was recently speaking to a project management recruiter. She mentioned to me that while many companies used to want all project managers to be certified, now it's less of a concern. Project management software has gotten so sophisticated that it now does much of the work that used to be manual. This discovery taught me that it really is worth the time to dig in and do your research before putting the time, effort, and money into a certification. Only take the plunge if it's necessary, and if you're fully committed to the path the certification opens for you.